Chennai Super Kings captain MS Dhoni’s daughter has been played with the csk team player, bravo. 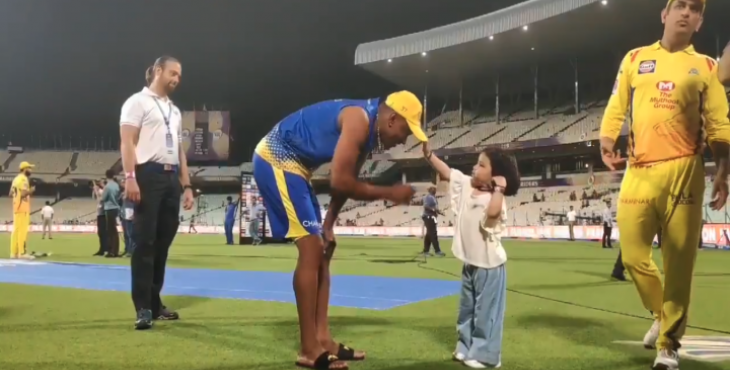 In the current IPL season, Dhoni’s daughter ziva Dhoni with the lovely dance players and covered all the audience. Yesterday’s Chennai Super Kings team triumph over the Kolkata Knight Riders at the Eden Gardens at Kolkata. After the match, ziva Dhoni, speaking to Dwayne Bravo, was out on the ground and was teaching her how to wear a cap. Dhoni fans who have recorded this beautiful scene and also sharing the web site.